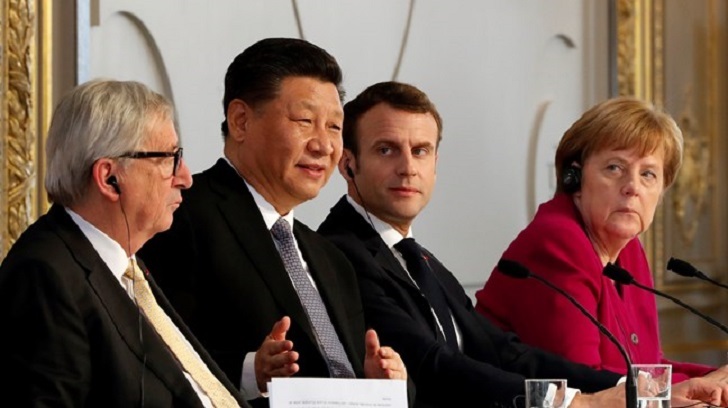 China's President Xi Jinping on Tuesday attempted to dispel concern about his country's growing presence in Europe at a meeting with French, German and EU leaders who stressed their desire for a more balanced relationship. French President Emmanuel Macron was joined by Germany's Angela Merkel and European Commission chief Jean-Claude Juncker for talks in Paris with the visiting Chinese leader which took place against a backdrop of growing tensions caused by Donald Trump's America. "Of course there are differences and competition, but it's positive competition," Xi told a joint press conference of EU-China relations. "We are advancing together. We shouldn't let suspicions lead us to be constantly looking backwards." The EU and China have both been on the receiving end of Trump's "America first" nationalism, protectionist trade policies and attacks on international agreements covering global warming, trade and Iran's nuclear programme. "Cooperation pays better than confrontation," Macron declared. In a joint statement at the end of Xi's three-day trip to France, the Chinese and French leaders both committed to working together to promote a rules-based international order. Merkel sounded a note of caution about how much the EU and China could achieve on their own, however. "There can't be multilateralism without the United States," she said. Though the leaders emphasised multiple areas where China, France and the EU would work together, there remain underlying tensions in the relationship -- the source of the "suspicions" that Xi referred to. Ahead of an EU-China summit on April 9, the European Commission this month labelled China a "systemic rival" and presented a 10-point plan proposing a more assertive relationship with Beijing, which Macron has welcomed as a belated awakening. Among other risks, the commission warned about the distorting effects of Chinese subsidies to its industrial groups, and European firms being forced to transfer technology to their Chinese subsidiaries. Juncker felt compelled to start his public comments at the joint press conference in Paris by saying: "I am a friend of China". But both he and Merkel raised the vexed issue of "reciprocity" in terms of trade and investments, meaning China should offer more opportunities to European firms in its domestic market and in Chinese-funded projects abroad. Europe wants pledges from China that its vast "Belt and Road" project -- huge investments in rail and road infrastructure in countries from Asia to Europe, also known as the new "Silk Road" -- will be carried out in partnership with the EU. The initiative is a "very important project" and "we, Europeans, want to play a role," Merkel said at the joint press conference. "That must lead to reciprocity and we're having a bit of trouble in finding it," Merkel added. EU Budget Commissioner Gunther Oettinger warned in a newspaper interview over the weekend that infrastructure in the EU "of strategic importance like power networks, high speed rail lines or harbours are no longer in European but in Chinese hands". Another point of contention is the use of telecom giant Huawei's next generation 5G mobile technology, which the United States sees as a "backdoor" for spying. Analysts were divided on Europe's bid to rebalance the scales with Beijing. "I really think that Europe is getting its act together," Philippe Le Corre, senior fellow at the Carnegie Endowment for International Peace think-tank, told AFP. But Steven Blockmans, EU foreign policy expert at the Centre for European Policy Studies, said that while EU members seemed aware of the need to stand together "everyone is trying to strike their best bilateral deal with China". Macron's decision to invite Merkel and Juncker to the talks with Xi underlined his desire to see all EU member states adopt a common approach to relations with Beijing. On the first leg of his five-day Europe trip, Xi visited Italy, which became the first G7 state to sign up to the "Belt and Road" initiative. Macron urged his Chinese counterpart to "respect the unity of the European Union" on Tuesday, underlining concerns that Beijing was seeking to divide members. While in France, Xi has inked a dozen deals on nuclear power, cultural exchanges and clean energy, while Beijing also committed to a huge order for 290 A320s and 10 A350 airliners from Europe's Airbus conglomerate. The total amount of the deals, including one on the construction by French energy giant EDF and a Chinese partner of offshore wind farms, amounted to over 40 billion euros ($45 billion).